How The Hoffman Process Works? 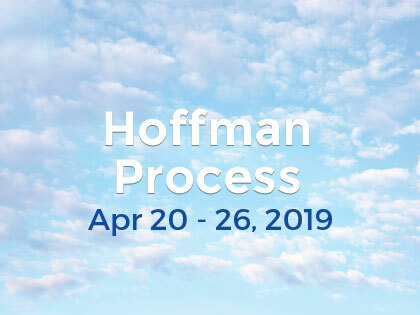 Over the last 47 years the Hoffman Process has been refined, tested and developed. In a very brief manner the high effectiveness of the changes that the Process provides to participants can be described by what we call the ‘Cycle of transformation’. Awareness sets us out on the journey to transformation. In order to change – to become more authentic, alive, and present – we need to know what’s in the way. Patterns. These are organizing principles of consciousness. For example : a constant risk-assessment of life, or an inner critical voice that may invalidate us. We get participants to trace these ‘patterns’ back to their family of origin, so that they become aware that they are learned behaviors. Given that the patterns are learned adaptations , we can ‘un-learn” them. However we need to do this not only intellectually but also on an emotional level. Expression is the next step. To let go of our patterns, we must exercise our Free Will; choose to step out of the pattern, and to take action using our Voice, Body, and Intention. We use our voice to say “No” to the pattern and “Yes” to what we are moving toward. In a very safe and professionally supervised environment we learn to claim our authentic emotional expression and move beyond what we perceived was permitted in our family of origin. This leads to a deep sense of ‘inner freedom’ and self acceptance. Compassion and Forgiveness lands us in our hearts. In order to truly move beyond the pattern, we must forgive and let go. When it comes to patterns, this means forgiving our parents and forgiving ourselves. In our lives, it often means taking on a practice of self-love and compassion, and holding others with compassion and curiosity. It means remembering that all of us have hurts, all of us have suffered, and being curious about what might have happened in other people’s childhoods and lives that have caused the patterns that they live with today. To get us there we have to open our hearts to the suffering that has been passed down from one generation to the next. The Process helps us express the repressed grief from the generations before, so that we can move on freed of guilt and at peace with ourselves . New Behavior – For change to take root, we must start practicing new behaviors. During the 6.5 day Process we engage in new self affirming practices as well as provide tools to help us transform our negative patterns into positive new behaviors. This will empower us to create the vision that we have for ourselves. The Hoffman Process is not a ‘quick –fix’ . It takes time to integrate the experience into our daily life. The Process is embedded into a 3 month follow –up program which also can be tailored individually dependent on how much Post –Process support is needed. HEAL THE PAST. LIVE THE NOW. CREATE THE FUTURE.